For other uses, see Wipeout. "Wipe Out" is an instrumental composed by Bob Berryhill, Pat Connolly, Jim Fuller and Ron Wilson. 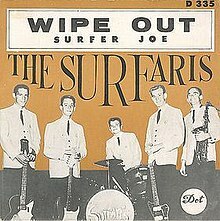 It is a twelve-bar blues first performed and recorded by The Surfaris, who were elevated to international status with the release of the "Surfer Joe" and "Wipe Out" single in 1963. The single was first issued on the tiny DFS label (#11/12) in January 1963. It was reissued on the tiny Princess label (#50) in February 1963, and finally picked up for national distribution on Dot as 45-16479 in April 1963. Dot reissued the single in April 1965 as 45-144. The term wipe out refers to a fall from a surfboard, especially one that looks painful. Bob Berryhill, Pat Connolly, Jim Fuller and Ron Wilson wrote the song almost on the spot while at Pal Recording Studio in Cucamonga, California in late 1962, needing a suitable B-side for the intended "Surfer Joe" single. One of the band members suggested introducing the song with a cracking sound, imitating a breaking surfboard, followed by a manic voice babbling, "ha ha ha ha ha, wipe out". The voice was that of band's manager, Dale Smallin. "Wipe Out" is based on the 1959 song "Bongo Rock" by Preston Epps. The afterthought track spent four months on the Billboard Hot 100 chart in the autumn of 1963, reaching #2 but kept out of the top slot only by Stevie Wonder's "Fingertips". The song returned to the Hot 100 in 1966, reaching #16 (and #63 for the year), and peaked at #9 on the Cash Box chart. The 1966 reissue sold approximately 700,000 copies in the U.S..Meanwhile, the original A-side "Surfer Joe", sung by Ron Wilson, only attracted airplay in the wake of "Wipe Out"'s success, and peaked at #62 during its six-week run. Wilson's energetic drum solo for "Wipe Out" (a sped-up version of his Charter Oak High School marching band's drum cadence) helped the song become one of the best-remembered instrumental songs of the period. Drummer Sandy Nelson issued different versions on multiple LPs. In 1970, "Wipe Out" peaked at #110 in the Bubbling Under Hot 100 Singles chart. The single spent a grand total of 30 weeks on the Hot 100. In science fiction author Robert J. Sawyer's Neanderthal Parallax series, the DNA sequence for a deadly virus is saved in a computer folder entitled "Surfaris". A character immediately recognizes this as a reference to "Wipe Out" and determines that the virus will wipe out all of the Neanderthals on a parallel universe's Earth. She then rewrites the DNA code to a non-lethal version and calls the file "Surfer Joe" in reference to the A-side of "Wipe Out". In the late 2000s, the track was used on Harry Hill's TV Burp, usually played when Harry or the Knitted Character ride a jelly. "Wipe Out" has been included in a number of film soundtracks, including those of Dark Star (1974), Dirty Dancing (1987), The Sandlot (1993), Toy Story 2 (1999), Recess: School's Out (2001), The Cat in the Hat (2003) and Surf's Up (2007). In 2014, the track was played in the 29th episode of season 5 of Regular Show as the "ancient call of the surfers". (1987) "The Twist (Yo, Twist)"
In the summer of 1987, the Fat Boys collaborated with the Beach Boys on a version of "Wipe Out" that made #12 in the U.S. and #2 in the U.K. The music video begins with an announcement of a boxing match with the Fat Boys and Beach Boys in attendance, but the match is interrupted by a fight. In the following scene, the Fat Boys load up a car with swimsuits and then drive off. The Beach Boys are driving a dune buggy through the city. Both bands go around the city in the direction of a beach, while they perform the song and draw the city inhabitants to the beach, where one of the Fat Boys tries to lift a heavy weight and is laughed at by some women. The Beach Boys play DJ in the street. The Ventures covered "Wipe Out" on their albums Let's Go (1963) and The Ventures On Stage (1965). English punk band the Toy Dolls recorded a very fast version of "Wipe Out" on their second studio album A Far Out Disc in 1985. In 1993, Animal from The Muppets covered the song for the album Muppet Beach Party. Released as a single in 1994, it reached number 38 on the UK Singles Chart. A music video was created to promote the single and the album. Jan & Dean's live cover of "Wipe Out" from an earlier television appearance was featured on their 2001 album Live In Concert: Surf City. Finnish comedy rock band Sleepy Sleepers covered the song in 1975 as Jytinää Eestissä ("Rumble in Estonia"). ^ Wolf Marshall. Stuff! Good Guitar Players Should Know: An A-Z Guide to Getting Better. Books.Google.com. p. 131. Retrieved September 27, 2016. ^ "The Surfaris". Internet Movie Database. Retrieved September 27, 2016. ^ "Wipe out in Canadian Top Singles Chart". Library and Archives Canada. Archived from the original on 2017-10-27. Retrieved 5 June 2013. ^ "Wipe out in German Chart". Media control. Retrieved 5 June 2013. ^ "Surfaris". Official Charts Company. Retrieved 5 June 2013. ^ a b "The Surfaris awards on Allmusic". Allmusic. Retrieved 5 June 2013. ^ "Wiping Out a Myth". Orange County Register. 2002. Archived from the original on 2007-09-28. Retrieved 2007-06-24. ^ "Morton Downey Jr. Dies, Combative Talk Show Host Was An Icon Of The 1980s". CBS News. 2001-03-13. ^ "The Fat Boys, feat. The Beach Boys - "Wipe Out" - ORIGINAL VIDEO - stereo HQ". YouTube. 2010-03-09. Retrieved 2016-09-27. ^ "Fat Boys & The Beach Boys - Wipeout!". Ultratop.be. Retrieved 2016-09-27. ^ "ANIMAL | full Official Chart History | Official Charts Company". Officialcharts.com. Retrieved 2016-09-27.